Description: Probably issued late in the campaign, the print seems to express the growing confidence among Republicans in the election of their candidate Abraham Lincoln. It may also be that like “The National Game” (no. 1860-42) the print was published after the election. As in “Stephen Finding His Mother” (no. 1860-35), Uncle Sam (center) is here shown as an elderly man in knee-breeches. He stands before the White House, about to take down a notice that reads: “Wanted. An honest upright and capable man to take charge of this house for four years. Undoubted testimonials will be required. 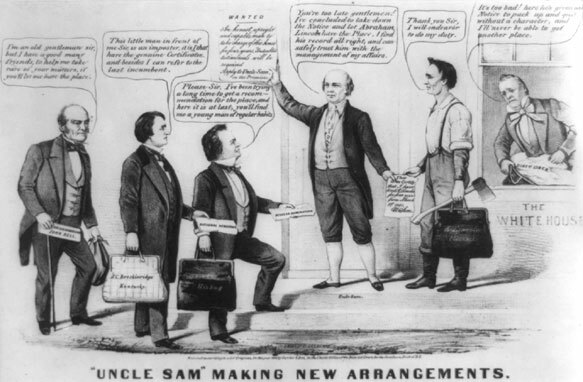 Apply to Uncle Sam on the Premises.” At the same time he hands Abraham Lincoln a notice that “I have hired [him] for four years from March 1st 1861.” Lincoln is in shirtsleeves and rustic boots, and carries an axe and valise. Uncle Sam announces to the other presidential applicants (left to right) Bell, Breckinridge, and Douglas, “You’re too late gentlemen! I’ve concluded to take down the Notice and let Abraham Lincoln have the Place. I find his record all right, and can safely trust him with the management of my affairs.” Lincoln thanks him, saying, ” . . . I will endeavor to do my duty.” The losers plead their cases. Bell, holding a cane and satchel, says, “I’m an old gentleman sir, but I have a good many friends, to help me take care of your matters, if you’ll let me have the place.” Breckinridge, the southern Democratic nominee, claims, “This little man in front of me Sir [i.e., Douglas], is an imposter, it is “I” that have the genuine Certificates, and besides I can refer to the last incumbent.” Breckinridge served as vice president under discredited incumbent James Buchanan, who can be seen at right through an open White House window, stuffing “dirty linen” into his valise. Buchanan complains, “It is too bad! here [Uncle Sam’s] given me Notice to pack up and quit, without a character, and I’ll never be able to get another place.”Northern Democrat Douglas asks, “Please Sir, I’ve been trying a long time to get a recommendation for the place, and here it is at last, you’ll find me a young man of regular habits.” Breckinridge and Douglas carry valises similar to Lincoln’s, and all three candidates hold pieces of paper with their party affiliations.